Become A Volunteer: We know we can’t save them all so we’re working hard to save as many as we can. If you would like to help us save one more animal consider becoming a volunteer. It doesn’t require any special training or skills, all you need is a desire to help abandoned or abused animals and a little bit of time. Even just a few hours a month can make a big difference to a dog or cat that needs you. 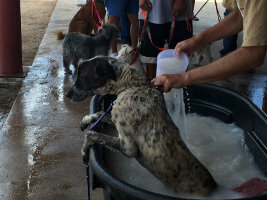 Flea and Tick Dip: The third Sunday of every month we are at the Tohono O’odham reservation to help the tribal residents with their animals. We provide free vaccinations, free dog and cat food, and dip all the dogs to prevent fleas, ticks, and sarcoptic mange. During this clinic we also help residents schedule spay and neuter surgeries and arrange for vet visits when their animals are sick or injured. Roll up your sleeves and get ready to work. 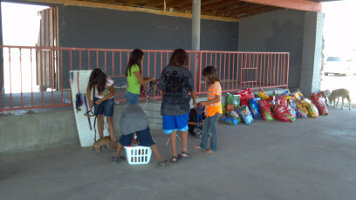 This clinic is the backbone of what we do and is a great way for us to stay in touch with the Tohono O’odom people and get some hands on time with the animals we are dedicated to helping. Adoption Sites: Come out to any of our adoption events and talk to people about our dogs and answer questions about our adoption procedures. Or just come out and spend some time playing with the dogs, they will love any extra attention you can spare for them. Our donation form is being updated. Please contact us if you would like to make a donation. Thank you!